Andy Ockershausen: This is Andy Ockershausen, and I’m just so grateful today to have an opportunity to talk to a man who is … I don’t want to say he’s an icon, because he’s too active. He is a very important part of Our Town. He helped build it. Arthur Cotton Moore was a graduate of Princeton University. He grew up in the city. In fact, he’s sixth generation. He’s known as all the buildings he’s put together, all the things he’s done. He has been an architect for over six decades. As an owner of the Chloethiel Smith firm, he has excelled in such phenomenal projects as his book in which he wrote, “Here is a man with so many accomplishments.” It’s hard to believe that one person can do this much, but he’s done it. And he’s such an important part of Our Town. What he has done is unbelievable. And Arthur this is your capital and our nation’s capital, but it’s Our Town. Welcome to Our Town, Arthur Cotton Moore. Arthur Cotton Moore: Well thank you very much. I’m very happy to be here. Andy Ockershausen: We know you so well and have watched you. I say we. That’s a collective “we”. What you have done for Our Town is unbelievable and some of your projects. But the basic part I remember about you, you always look … When I wanted somebody to be an architect, I’d call central casting and if I did they’d send Arthur Cotton Moore. He looks like an architect, am I right? He walks, he talks like it. Arthur Cotton Moore: I didn’t bring my T-square. Andy Ockershausen: Not with us anymore, but he was very instrumental in getting me involved with the Board of Trade with a man named Leon Chatterley. Andy Ockershausen: Do you remember that name? Arthur Cotton Moore: Yes I do. Andy Ockershausen: And I didn’t know he was an architect but he always looked like a million bucks too. He had his own business after a while. Arthur Cotton Moore: Right. He did, yeah. Andy Ockershausen: I know he passed away but he was a very important part of Our Town. Andy Ockershausen: But nobody’s done what you’ve done, Arthur. From St. Albans, you Mastered in fine arts and architecture at Princeton. A lot of my people, and I say my people, the Evening Star, own this company, WMAL, and the Star family, almost all of them were Princeton graduates. They grew up … the Kauffmanns and the Noyes and so forth. Arthur Cotton Moore: I didn’t know that. Andy Ockershausen: Big part of Our Town, the newspaper people. Arthur Cotton Moore: Yes, indeed. Yes, I remember The Evening Star was the paper for a long time, and then Times Herald was a scandal sheet, and then it morphed into the Post. Andy Ockershausen: It’s so wonderful that you remember that the demise of The Star was caused mostly by television because the afternoon delivery became impossible, and The Star owned a very valuable TV station in Channel 7, so they were hoisted a little bit in their own petard of business. TV was good, but the newspaper went under. Which was some kind of sad Arthur. Andy Ockershausen: I remember him vividly. Arthur Cotton Moore: And he was holding a baby, and that was my mother. Andy Ockershausen: Is that right? Arthur Cotton Moore: And it was on . . .in the Evening Star. Andy Ockershausen: He was a world class cartoonist, but political cartoonist. Arthur Cotton Moore: Political cartoonist. He’s one of the first ones, yes. Andy Ockershausen: And there was a guy named Gib Crockett too. I knew these Star people. I knew that they were all Princeton. The ones I knew went to Princeton anyway. But they’re probably older. And then The Star went out of business. That building is still down there in Southwest. You didn’t have anything to do with that did you? Arthur Cotton Moore: No. No, I’m clean. Andy Ockershausen: Janice and I are constantly amazed, Arthur. We ride through the city at least once or twice a week on the Southeast Freeway and see what’s happen at The Wharf, what’s happen along by the Ballpark. I know the Wharf was one of your ideas way back to do something special. Arthur Cotton Moore: To do something of that, we did do a book, which is not this book here, but a book on waterfronts all over the country, and we looked at 96 waterfronts, and we picked six. Basically one of them was the Washington Channel Waterfront which I had worked on a little bit and was one of the ones that we felt was not successful. And so The Wharf is an improvement, a very big improvement. But mostly what we did when I worked on the Washington Channel Waterfront was that there was a plan for a kind of Whitehurst Freeway along there. We fought that. Finally, we got rid of it. So I think that was the biggest achievement we made down there. Andy Ockershausen: Was there some talk of getting rid of the elevation and put it down at ground level? Arthur Cotton Moore: No, it was gonna be a real freeway. It was gonna be part of the Loop Freeway around Washington. There’s a section that was built that was in front of the Kennedy Center, and actually I have a little story. I was working for somebody else, but I was appointed as the architect in charge of an extension of the innerloop, and the engineers came down and showed me what they had in fact done, and they had proposed building a freeway, which went right through the Belgian Embassy, then it went crashing through the Cosmos Club with one little ramp that flipped off the Phillipps Collection, and then it charged through the Indonesian Embassy. And so I said, “Why’d you do that? We’ll have to declare war on two friendly countries.” They said, “Well, we’ve never been to Washington. We just have a map of all the little buildings where we went through all the old little buildings.” And so I was fired. Andy Ockershausen: You hadn’t even seen what they were working on. Oh my. Now you did Washington Harbour, correct? Arthur Cotton Moore: Yes, that’s correct. Andy Ockershausen: Wasn’t that originally where they have the area there where they have the ice skating rink? Wasn’t there a harbor there? Couldn’t you pull a boat in there at one time? Andy Ockershausen: Beautiful, beautiful facility. Arthur Cotton Moore: I wanted to celebrate. Nobody could get to the waterfront in those days. Georgetown was an industrial slum. It was, as you know, the famous saying on the flower mill, “The odor you smell did not come from this plant.” The rendering plant was there, the Hopfenmaier Rendering Plant. We tried to get various ways to get rid of it. Of course the highway boys were the ones who had the money and the eminent domain. So they finally got it. But the whole place was a slum. You couldn’t get down to the waterfront because . . .and the actual waterfront was horrible because where they dumped all the concrete and the rest of it, so it was a truly tough waterfront. So I remember when we started in on this thing. It was a huge gravel plant. Potomac Sand and Gravel . . .
We swung a bottle of champagne against it, and it wouldn’t break. Arthur Cotton Moore: It was tough. But anyway, so the whole idea was essentially open the whole thing up. That’s why I wanted … The streets that you see there, 31st Street, Thomas Jefferson, and 30th Street … They never existed because that’s all man-made land. Andy Ockershausen: Is that right? We use them all the time now. Arthur Cotton Moore: Yeah, the end of center of Georgetown was K Street, which was called Water Street at one point. So those never existed. So we put in these three streets, and that was the first thing, because we wanted to be able to have people go right down to the water. And then we wanted to open it up and make it a celebration of being on the waterfront. So people have gone down there, and Fisher calls it a psychotropic place which is a $20 word. But anyway, it’s a place where people go, and they have … A lot of people become engaged there, and there are, in fact, weddings and all sorts of things that happen there. So, I think it’s that … What it is is something I was very concerned about because I had written this book about waterfronts because it engages the water front, engages, engages the magical point where the land meets the water. Essentially, I don’t know whether it’s an atavistic, or original kind of feeling that we had, but people love to have dinner next to the water. Andy Ockershausen: Absolutely. I can relate to that. Arthur Cotton Moore: I know. So, if you go down there, the actual wood. . . boardwalk . . . That actually is cantilevered over the river. You were actually walking in the river. I wanted you to experience the river in every way. Arthur Cotton Moore: So I lowered the land to meet the river, and I brought everything down there. Even down to some of the small details of how the drainage is kind of rippling and a series of stepping stone fountains moves you down to the river. Everything. The way that buildings go in and out and the rest of it. Arthur Cotton Moore: Everything to move you down to the river. I moved the Tower. Tower is very important in any kind of a waterfront plaza, but I moved it off to the side because I wanted you to see right down there. See from M Street, you can see down to the water. Andy Ockershausen: It’s magical. I think that tower is so important, and I recall it vividly when it first went up. Our relationship goes back to when they were working on the project, particularly Janice and I were very close to Tony and Joe’s. I was a partner in the deal with Tony. Tony Cibel whose still there running it. But we’ve seen what’s happened to all the restaurants there, and the thing has just been spectacular. They’ve had their troubles, now, with that underground … They had to flood. Arthur Cotton Moore: We designed the lowest level to flood. Andy Ockershausen: Yes, that’s correct. Arthur Cotton Moore: We designed it because otherwise the whole project would become a boat. It would float away. So, we designed it so that we know when the river’s gonna crest because there’s a cage up at Harper’s Ferry. When it’s gonna be 10 feet over mean low water. 10 feet is a big surge of water. Then we take in the water, and it’s under the concrete benches on the west side. We pump it actually in fast because we want to load that lowest level fast so it is real ballast and really hold the building down. So, that’s why one of the things that are in this book is the national underground which is a flood control project which we’re gonna flood. It’s an underground basic garage. Andy Ockershausen: It’s a creek . . . correct? Underneath the mall? Wasn’t there Tiber Creek? Arthur Cotton Moore: Tiber Creek is where Constitution Avenue is. Andy Ockershausen: I got you. Arthur Cotton Moore: The problem with it is that we have two kinds of flooding in Washington. One is river flooding, and the second is internal flooding. Arthur Cotton Moore: So, what Tiber Creek was … Basically, the land forms slope down to what was once Tiber Creek and is now Constitution Avenue. The result is it floods, and it floods, and I make a slight joke that it’ll put the government out of business quicker than the Republicans can. Andy Ockershausen: Our Town is flooded. Arthur Cotton Moore: No, it has flooded and just shuttered everybody down. As a result, the archives built a special vault around them because they were afraid that the constitution would float away. But the other buildings were all shorted out because us architects always put the electrical switch gear in the first basement. That was the first thing that got flooded. Andy Ockershausen: They never tried to keep a hole. Architects wouldn’t. I think the builders did that. But, Arthur, this is so, so important that we hear about these things. We’ll be right back. 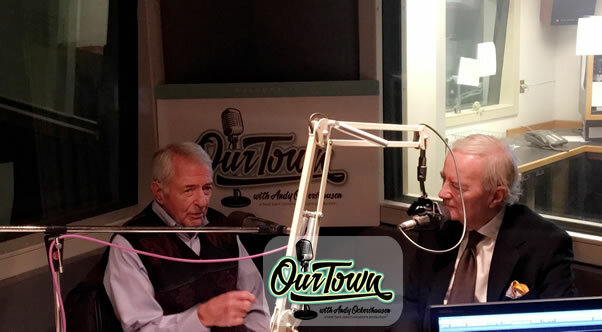 This is Our Town, and we’re talking to Arthur Cotton Moore and what he has done, and what he has suggested for Our Town has been unbelievable. It’s out nation’s capital, but thank you, Arthur, for making it Our Town. We’ll be back to talk more about the waterfront. Andy Ockershausen: This is Andy Ockershausen. This is Our Town. In a dynamic conversation … I think it’s dynamic because he’s opened our eyes. Arthur Cotton Moore. We were talking about … My wife is extremely interested in the flood gates and how it worked and why they had to flood and flooded out our friends, Tony and Joe’s, for a year and a half. Arthur Cotton Moore: Well, I can tell you exactly why. A brand new ownership came in, and they fired the long-term manager. Andy Ockershausen: Project manager or building manager? Andy Ockershausen: For high water? Andy Ockershausen: You were still living down there? Arthur Cotton Moore: No, no. I’m living at the Watergate. Andy Ockershausen: … you were living above the gas station for a while, right, in the building? Arthur Cotton Moore: Yes. That was before. But now, we’re living at the Watergate, and we have a view of Washington Harbour. So it was raining a tremendous amount of rain on Saturday, and the crane company that comes and lifts up the gates called up and said, “Don’t you want us to come and lift up the gates?” And they said, “Oh, I guess so,” and so they came and lifted up the gates. Andy Ockershausen: You can’t stop it either. Andy Ockershausen: It was human error. Andy Ockershausen: There’s nothing wrong with the building, right? Arthur Cotton Moore: Nothing wrong with the building, in fact, but they had taken down two or three of these very giant flood gates. That’s plenty of room for the river to come in. Plenty of room. Andy Ockershausen: And it did. Arthur Cotton Moore: So they did it. They did it to themselves. I’ve always said the flood gates are a great thing, but one thing you gotta do is you gotta pull em up. Andy Ockershausen: Little late for that. Janice Iacona Ockershausen: What a story. Arthur Cotton Moore: Little late for that. Mm-hmm (affirmative). Andy Ockershausen: That’s an amazing story. Like you said, a hundred million dollars. It cost a lot of people a lot. A lot of people cost their lives because they had a lot of help from the restaurants. They couldn’t pay them because they had no income. Arthur Cotton Moore: Everybody had to move out. Everybody. People who lived there as well as offices. Everything. Everybody. Andy Ockershausen: We all remember how bad it was. Remember for the business and the community. Let’s talk now about one of your things that you presented in a book that I read that I found interesting, but I have been hearing about it for years. It’s some sort of water taxi service to three or four of the great points in and around our river. Then you had offered it … What was it? 50 years ago? As a project, a possibility? Arthur Cotton Moore: Let me see. It was about 1986. How many years ago was that? Arthur Cotton Moore: Yeah. Yes. Quite a bit. Well, around 1986. It began with me saying that the Kennedy Center is kind of an odd duck in a way because it cantilevers over the parkway three quarters of the way, but it’s sort of floats there. It doesn’t have any kind of anchor to the ground, and I said what it should have is a grand set of stairs coming down with two elevators on either side of it and that it should have a dock. And the result … People could come and sit on the stairs and watch the . . .
but the main thing would be that if there was a similar dock for Rosyln. Roslyn has 20,000 parking spaces which are empty at night and on weekends at exactly when the Kennedy Center is operational. So, people could park in Roslyn, or they could take the metro down to Roslyn and catch the ferry which would make a loop between Roslyn, Kennedy Center, and Washington Harbour. A nice, simple loop. A short loop so there would not be a lot, but it would be a very pleasant way to go to the theater or get dinner in Washington Harbour, and then go to the theater. It’s a very logical loop. Andy Ockershausen: But that’s a major problem at our community of Our Town is the three jurisdictions. Arthur Cotton Moore: Yes, I know. I know. Arthur Cotton Moore: Very big problem. Andy Ockershausen: You fight them all the time. Arthur Cotton Moore: But the people in Roslyn. It’s called Roslyn Renaissance. Those people were very enthusiastic and so was their representatives, and they have representatives for that dock and that side, and the guy who was then planning for the park service was not keen on it. So, I still think it can be done, and I still think the idea of the steps coming down, the dock there, so that you could go, people all in Virginia could come, or you could actually just walk down the stairs and walk around a nice promenade around Georgetown. Arthur Cotton Moore: That guy is retired. One of the advantages is if you last long enough, everybody will either die or retire. Andy Ockershausen: Isn’t that funny? I’ve heard people. Like in the parking business, they say we don’t have to worry about that guy. He’s retired. Let’s go ahead and build some parking garages. That’s where I hear Doggett and Antonelli and all those people talk over the years. Andy Ockershausen: Harbor tried to do it with putting up the ferris wheel and having people focus on the . . .
Arthur Cotton Moore: The National Harbor. Yes. Andy Ockershausen: I know Milt Peterson quite well. . .
Arthur Cotton Moore: I just wish there were more involvement with the river. Andy Ockershausen: Right. Use the water. Arthur Cotton Moore: Use the water, yeah. Why are you there? To me, that land that is on the river where I think that precious place, where magical place, where the land and the water meet, that’s a very important place, and you’ve got to take advantage of it. You’ve got to really use it. Andy Ockershausen: Absolutely, and they don’t. Arthur Cotton Moore: They don’t. Andy Ockershausen: Like the Kennedy Center doesn’t. That has no relationship to the water. Arthur Cotton Moore: That’s why I wanted to make the steps down . . .
Andy Ockershausen: Also, that would help with pedestrian traffic too, if they had some steps to go down to the water. Arthur Cotton Moore: Exactly right, and it’d also be a land bridge for Foggy Bottom down to the river. Arthur Cotton Moore: At the Lincoln Memorial. That was the Lincoln Memorial, and the steps were down, and they called it Water Gate at that point. Andy Ockershausen: And they had a little band shell right there on the river. Arthur Cotton Moore: That’s exactly what did them in. The jets come in. Their jets came in, you couldn’t play any music at all. Andy Ockershausen: You’d have to spend … But the young people missing that because that was an important part of Our Town was the Water Gate. Absolutely. Andy Ockershausen: Matter of fact, it had a wonderful restaurant. Do you remember the Water Gate restaurant? Arthur Cotton Moore: I do indeed. It had the greatest popovers. They had fantastic popovers. Arthur Cotton Moore: The rest of that was Gas Works. Andy Ockershausen: The Gas Works. Arthur Cotton Moore: There was one section that was so bad … I lived in that area in a little house on N Street. There were some streets you would no drive down with your car because you wouldn’t have wheels on it. Andy Ockershausen: I can believe that. Believe me. We knew our way around. But, Arthur, the things that you have pointed out about Our Town … There’s been so many great things, but you run into this jurisdictional dispute constantly with the area and also with Uncle Sam, so we’re really dealing with four different entities when you try to do things. Arthur Cotton Moore: Let me tell you. It’s much worse than that. Much worse than that. On dealing . . . we have about two or three projects related to the National Mall. We counted up how many agencies, congressional committees, and what I call fiefdoms, and there are 37 of them. Andy Ockershausen: With just the one National Mall? Arthur Cotton Moore: One National Mall. 37. And I’ve been to all of them. It’s incredible, but it’s just … I have a diagram of this. You cannot believe it. Not only that. After you’ve gone through the six district agencies and the eight federal agencies, and you’ve been up to Capitol Hill to see the seven Senate oversight committees and the seven House oversight committees, then you have to deal with the fiefdoms. Let me tell you. They don’t like each other. Andy Ockershausen: But progress still … When Chip Akridge the trust for the mall. I know Chip very well. I said, “Chip, why would you get into something like this? You gotta know Janice, baby. You’re dealing with all the bureaucracy,” but he smiles and keeps trying to keep it alive. Arthur Cotton Moore: Nope. In fairness, Chip is a wonderful guy, and his Trust is a fine thing, but they have already set their mission on maintenance. They are going to raise money for maintenance and only maintenance. Andy Ockershausen: Doing only maintenance? Andy Ockershausen: They just had to clean it up. Arthur Cotton Moore: Just trying to maintain it. You go down Constitution Gardens, and the pond there is full of algae, and it’s falling apart and all sorts of problems. There are problems everywhere. Andy Ockershausen: It’s a huge city. Arthur Cotton Moore: Yeah, it’s a huge city. We’re talking about … Even the Smithsonian’s got hundreds of millions of dollars of differed maintenance. You’ve got a lot of … So maintenance is very important, but I’m trying, and I’m with a group, a national coalition on the mall, and we are trying to get together a group that is not unlike the McMillan Commission of 1901, to take an oversight and a visionary view because we have, as I show in the last part of the book … I’m showing an expansion of the mall because when we looked at it, there were 41 museums and memorials that wanted to be on the Mall. I said if they were all built, it would like Forest Lawn Cemetery. It would just look terrible. So we have to expand it, and there has to be an expansion of the mall because that’s exactly what McMillan did. Then McMillan commissioned – the wall went only from the Capitol to the Washington monument. So the McMillan Commission extended to where the Lincoln Memorial is. It was all marsh and everything like that. Andy Ockershausen: The reflecting pool. That’s where they put the pool, right? Arthur Cotton Moore: Now we have the Vietnam and the Korean, and now they were talking about the Gulf War. The first Gulf War. They’re gonna have a memorial to something that I call the GWAT. That is the global war on terror. The GWAT’s gotta have a memorial. That’s just one of the many, many, many memorials that have to be down there. Andy Ockershausen: I hadn’t heard about the global warfare. That’ll never end. There will always be a war. Arthur Cotton Moore: It will have to be an expansive memorial. Andy Ockershausen: They need a big piece of land for that. Arthur, that’s so interesting to talk about our mall and how important it is to us. But we’re gonna take a break here only to get a breath for both of us. So we’ll be right back here on Our Town. This is Andy Ockershausen with Arthur Cotton Moore. Andy Ockershausen: We’re talking to Arthur Cotton Moore. This is Andy Ockershausen, and we’ve been talking about the water and the rivers and the mall. One of the things I wanted to ask Arthur about is his feeling now that we’ve got two new places on the water. We’ve got something called the old Navy Yard, and we’ve got The Wharf. The Wharf is only half done as I understand. They still got the rest of the project. Do you appreciate … Have they been able to use the water the proper way, do you think? Arthur Cotton Moore: Much better than National Harbor. I think that I would say the wharf is much more engaged with the water. It is very linear, and I will say, by the way, that Washington Harbour cost 70 million dollars, and they’re spending a billion. So I think that I would love to have that budget. Andy Ockershausen: Two billion to budget, isn’t it? Arthur Cotton Moore: Could be. Andy Ockershausen: That’s just the beginning probably. Andy Ockershausen: Like you have at Washington Harbour. Arthur Cotton Moore: This is very important. It’s as if the people concentrate too much on buildings and not on the space and the relationship of the buildings to each other and how they produce a public space. So, it’s called urban design. But that’s a fancy name. But it’s basically the relationship where people can gather, and they have a sense that there is a center. I haven’t seen it come about yet, so I hope it will. Andy Ockershausen: Well, right now, they’re still in a state of flux, but they’re still getting buildings open down there. Now, how about the old Navy Yard and what they call that The Navy Place. The Navy Yard’s still there of course. I remember the Navy Yard when they used to build big guns to ship to fleet. Andy Ockershausen: I had relatives that worked there, so I knew what that was. Now, it’s all been redeveloped, and they seem to be using the water somewhat down there. Arthur Cotton Moore: Well, somewhat. As I understand, there’s a ship or two that’s anchored firmly in the mud. Andy Ockershausen: Now, that’s good. You gotta be anchored firmly in the mud. Arthur Cotton Moore: Anyway, again, I’m a little bit concerned because again I believe in the preciousness of a waterfront. So I would not have put the stadiums down there. Andy Ockershausen: Right. I understand. Arthur Cotton Moore: Because they’re again internal focused, and when I’ve been to the stadiums, they have not been what they used to say had a demanding view of the Capitol or the rest of it. But anyway, it’s great to have the stadiums, although I still think they oughta do something with RFK. Andy Ockershausen: Yeah, that is a white elephant right now. Arthur Cotton Moore: It’s a white elephant. Every single team has moved out of there, so I have a book on comics that I’m gonna bring out. I have various visions of RFK as a place where you might grow peas and corn in a field. That kind of thing. But anyway, basically I like the fact … Well, Buzzard’s Point down there, you know. Buzzard’s Point. Andy Ockershausen: I know it very well. Arthur Cotton Moore: A building was built there, and I just cannot tell you how awful it is. It’s a little like what the … I don’t know if you know Annapolis. They built a hotel right there down in the waterfront. A single building can really ruin a waterfront, and it can really ruin it. Andy Ockershausen: You think that’s happened? Andy Ockershausen: Well, the architects are the people building it, but that stadium when it originally planned, we talked about, had a view of the Capitol. Arthur Cotton Moore: Yes, that was the idea. Andy Ockershausen: The home plate was gonna look at the Capitol. I hate to use an example, and I think Baltimore did a great job with their stadium. Andy Ockershausen: Right. They used the old yard. Arthur Cotton Moore: I worked a lot with the railroad, and I even worked on that building a little bit, but that was before they got the idea of making Camden Yards. Andy Ockershausen: I think they had strong leadership with … William Donald Schaefer was the mayor of Baltimore . . ..
Andy Ockershausen: Between he and Ed Williams and the people that wanted the Orioles to stay in Baltimore, they built a nice facility. They use that brickwork and everything. I agree with you. D.C. is just a … It’s not even a ballpark. It’s a rice bowl field. The old ballpark – Griffith Stadium. You and I grew up over there. Arthur Cotton Moore: Oh, I remember Griffith Stadium very well, yes. Andy Ockershausen: Baseball. And it was a big part of our lives in Our Town. Arthur, what has happened though all over in Our Town, your imprint has been significant even if you didn’t design it or build it. You were around, and people always refer to you and always would talk to you about projects. I know that for a fact. Your name would always come up. That’s quite a burden on you. You’re responsible for Our Town. Arthur Cotton Moore: No. I can’t take that. Remember those 37 agencies. Andy Ockershausen: Yeah, the 37 people that run our mall. They also have the national parks under their control too. All those parts of congress and so forth. Arthur, what we see so much happening now with Metro has been a … Who’s running the series of wouldn’t it be a terrible place without Metro? One of the magazines or the newspapers saying, “What would we do without Metro?” It’s terrible to even think about, to me. Arthur Cotton Moore: Oh, indeed it is. Andy Ockershausen: We have gridlock. Without Metro, we’re dead. Andy Ockershausen: The book is on Amazon, right? Arthur Cotton Moore: In the book, I’m talking about the homeless because it’s a big issue in Washington, and they have these cars that they’re now throwing away. The 4000 series because they don’t have the right propulsion, so they’re taking the cars. So, the cars are being thrown away, so that means they have zero value. But in fact, they have actually less than that because they’re paying a salvage company in Baltimore 1.3 million dollars to chop them up. So, they have really negative 1.3 million dollars. I did a drawing, and that’s in the book, on how they would make two very nice one-bedroom apartments. Arthur Cotton Moore: They have good windows. They’re very solid, and they could withstand very strong storms. Not like the usual sort of thing. Andy Ockershausen: It’s in the book. Arthur Cotton Moore: It’s in the book. I hope someday maybe I can bring one down and put it right next side of the District Building and make them come out and look at it. Andy Ockershausen: Get the Mayor to come in and spend the night. That would be a hoot. Now, Arthur, going on in other parts of the city, of course, you’re just not focused on the water. You’re not just focused on Georgetown. Arthur Cotton Moore: No, no. Andy Ockershausen: But I referred to you when you lived in Georgetown right above the ESSO station, and they had the sign up – “Remember the Valdez”? Arthur Cotton Moore: I do indeed. I remember that fellow. He would always hang that thing out. Andy Ockershausen: It’s not there anymore. That was a great time though for Georgetown and the boom. Now, how about our … We have great difficulty, Janice and I. Do we love the canal and the walk. They seem to let the canal be neglected. I don’t know whether that’s the Park Service or Uncle Sam or what, but I think that canal is a national treasure. Arthur Cotton Moore: Oh, it is definitely a national treasure, and I remember when Justice Douglas actually walked, and he took the press along there, and . . .
Janice Iacona Ockershausen: Harden and Weaver were there. Andy Ockershausen: Harden and Weaver walked with them that day. Andy Ockershausen: We did the whole broadcast. Arthur Cotton Moore: Is that right? Andy Ockershausen: He was a real maverick, I know that. Arthur Cotton Moore: I was an officer at the Georgetown Planning Council which is a little private group. We were supporting that whole thing and the rest of it. No, I think it’s a wonderful thing, and I think they’re crying just for funds right now and money. I know that it was sort of a joke, some of us went up and poured a glass of water into the canal. It was a lovely thing. There used to be these … They weren’t horses. Donkeys, basically. Andy Ockershausen: Oh, yeah. Mules. Arthur Cotton Moore: We had our office in what was now Canal Square, and we had our ficus trees, so we put them outside because they were looking a little peaked. I looked out, and they were chewing the ficus trees. If you run up behind one of those big burros, they look really big. Andy Ockershausen: They’re dangerous too. Andy Ockershausen: That was such a treasure for Georgetown, though, to have that little canal boat and the keel boats, and they pull them up the river. We miss that. I don’t know why we can’t work out some way. I guess it’s impossible to charge people to use the facilities on the canal. A lot of the national parks are charging admittance for automobiles and so forth. You can’t do that. There’s got a way be a way the public commits to that. Arthur Cotton Moore: I put a deck along the canal there. I don’t know whether you’ve ever had dinner there. If was the Sea Catch restaurant. It’s not there. Andy Ockershausen: That was down below, wasn’t it? The Sea Catch. Arthur Cotton Moore: Yes, but it had a deck out on the . . .
Andy Ockershausen: Yes, I remember vividly. Arthur Cotton Moore: In order to get that deck, I had to go to … I asked first one smokey bear hat man after another, all the way, and I finally wound up with the Secretary of the Interior, Stewart Udall. I said this is what we wanna do, and I think it’d be really nice. He said, “What’s wrong with it?” He looked at the next guy, and the next guy said, “What’s wrong with it?” To the next guy, and what’s wrong to the next guy. Andy Ockershausen: Couldn’t find anything wrong. Arthur Cotton Moore: Then we had it. Andy Ockershausen: I remember the deck quite vividly. The whole thing back there. Did the Marriott ever own any part of the Sea Catch? Arthur Cotton Moore: Yes, it did. It didn’t call it Sea Catch, it called it Port o’ Georgetown. Andy Ockershausen: That’s it. I remember that. We had a Christmas party. Arthur Cotton Moore: We had a great deal of time trying to put the F on the O. But anyway, my other book, Powers of Preservation, it starts with us pulling up . . . Mr. Marriott had put down indoor outdoor carpet on my beautiful brick plaza there in L Square, and we were pulling it up. Andy Ockershausen: It had to go. Arthur Cotton Moore: It had to go. They had a jolly jumping sailor in front of it. It was … Anyway, the Sea Catch was really nice, but it was not a money maker. Andy Ockershausen: A nice little restaurant with good food. You went down the steps. My problem is, Arthur, I’ve been around not nearly as long as your family has, but I’ve been around a long time, and I love Our Town, and all the things you talk about, they’re all in there because we sampled them all. That’s what’s so great about it. We just didn’t hang out in one area. When I was growing up, we sampled the whole city. That’s true from Eastern High School. People would never go out there. They don’t know where Marlow Heights is. They don’t even know where a lot of places are. The same thing with Northwest. But there’s so many great parts of Our Town, and you were so instrumental even if you didn’t develop it yourself. They knew you were here looking at it. That’s important, Arthur. Your presence and your clout. Arthur Cotton Moore: That’s very nice of you to say that. Andy Ockershausen: You had clout at one time. Andy Ockershausen: Yeah, I used to be able to get the mayor on the phone. Not because of me, but because of how important WMAL and Channel 7 was that the mayor would answer. It goes back to Walter Washington. People like that. Janice and I had the pleasure and the privilege of working at this company, worked for The Evening Star broadcasting, and we watched the city because this was important to us as citizens and as broadcasters and newspaper people. Our Town was so important, and this book and the things you’ve done has made it more important. Our nation’s capital. Arthur Cotton Moore: I thank you very much for that. Andy Ockershausen: Well, it’s not anything I made up, Arthur. It’s here. How do we get the book? Through Amazon? Andy Ockershausen: There it is. Arthur Cotton Moore: Our Nation’s Capitol, and there’s a subtitle about pro bono ideas. Ideas that I’ve suggested over the years, and some of them have come out, and some of them are still percolating. Andy Ockershausen: Some of them are still percolating. It may be for a long time. Some of them, you run into the brick wall of jurisdictions. You run the brick wall of government and so forth, but you didn’t give up, and it’s still there. I hope people will subscribe to that that you have been such … I hate to use the word icon because you’re still young. Best dressed man in town. I knew he was an architect when I met him 50 years ago. He doesn’t remember, but the people that I grew up with were important in Our Town and still are. The Princeton guys. We just treasure you and what you have done for us. Our Town is still spectacular. Arthur Cotton Moore: It is. Andy Ockershausen: A lot of growth to come. But when you get down on that river tonight when you get home and look across to the island, it’s heaven. Arthur Cotton Moore: It’s heaven, yes. No, we have a beautiful city. One of the things I would only stress about is it’s a planned city by Pierre. Actually, he wanted to be known as Peter. Peter L’Enfant, wanted to be American. Arthur Cotton Moore: Wanted to be American. And the McMillan Commission. Andy Ockershausen: You said McMillan Commission at the turn of the century? Andy Ockershausen: The McMillan Reservoir was named after him, correct? Arthur Cotton Moore: That is absolutely true. Arthur Cotton Moore: Yes. He’s a relative of mine. Andy Ockershausen: … Had the DC committee? Arthur Cotton Moore: Oh, no. Andy Ockershausen: You remember him. Arthur Cotton Moore: Oh, I remember him. I worked on the Washingtonian when I was first coming out, and they did a story about the whole gang. They hated Washington, and really it was really nasty. Andy Ockershausen: They didn’t want to spend any money here. Arthur Cotton Moore: No. Well, they still don’t. Andy Ockershausen: They still don’t. How about Tom McMillen, the basketball player? He’s a local guy. His family grew up here. But Arthur, thank you so much for being with us. I can’t tell you how much we, and the we means everybody here, appreciate you and what you have done, and love love love the book. I’d like to, before you leave, get you to autograph it for me. Arthur Cotton Moore: I certainly will. Andy Ockershausen: Lizzy got it, but Lizzy’s parents are very influential. They have money. That’s called influential. As Jack Kent Cook used to say, “Are they people of consequence?” I said, “Mr. Cook, what’s that mean?” He says, “Are they rich?” That was “of consequence” to him. But Arthur Cotton Moore, it’s been so much of a pleasure. Jenny, did we leave anything? My producer here ran WMAL and made it what it is. Me. We celebrate our 25th wedding anniversary, and it’s been a great 25 years of us being together to look at Our Town. We’ve lost so many good people. I guess that happens every day, but there’s so many still good ones around, and you’re one of the best. Thank you, Arthur Cotton Moore. I loved having you. Arthur Cotton Moore: Thank you for having me here. Andy Ockershausen: This is Our Town. This is Andy Ockershausen. We’ve got a wonderful conversation with the world-famous Arthur Cotton Moore. Announcer: You’ve been listening to Our Town season three presented by GEICO, our hometown favorite, with your host Andy Ockershausen. New Our Town episode are released each Tuesday and Thursday. Drop us a line with your comments or suggestions. See us on Facebook or visit our website out ourtowndc.com. Our special thanks to Ken Hunter, our technical director, and WMAL radio in Washington DC for hosting our podcast. And thanks to GEICO. 15 minutes can save you 15% or more on car insurance.